Emirates SkyCargo, the freight division of Emirates, has expanded its presence in Turkey with the start last month of a non-stop service to Sabiha Gökçen International Airport. The new service augments cargo capacity to and from the country by an additional 168 tonnes per week. The flight, which will be operated by an A330-200 aircraft with 24 tonnes of cargo capacity, will be the only daily wide-body passenger aircraft with bellyhold capacity to serve Sabiha Gökçen. Flight EK119 departs Dubai at 17:15hrs and arrives at Sabiha Gökçen at 20:15hrs the same day. The return flight, EK120 departs Sabiha Gökçen at 22:05hrs and arrives in Dubai the following day at 4:20hrs. “Our cargo customers are increasingly looking for ways to ship their goods across the world at a faster pace. The introduction of service to Sabiha Gökçen not only provides an additional gateway for our customers in Turkey, but it also provides quicker access to shipping lanes for businesses located in eastern Istanbul,” said Nabil Sultan, Emirates divisional senior vice president, cargo. Sabiha Gökçen Airport is located 60 km east of Istanbul’s Atatürk Airport, where Emirates SkyCargo already offers 11 weekly flights on Boeing 777-300ER aircraft. The new flights to Sabiha Gökçen will save businesses in eastern Istanbul at least an hour’s journey by truck, as it will reduce the need for cargo to be trucked across congested city streets to be shipped via Atatürk Airport. Each year, Emirates SkyCargo ships more than 5,300 tonnes of cargo in and out of Istanbul. Top imports include medicines, vaccinations, carpets and textiles. The airline began flying to Turkey’s largest city in 1987, making it one of the longest-running routes in Emirates SkyCargo’s network. Emirates SkyCargo is the world largest international air cargo carrier. In the 2014-15 financial year, Emirates SkyCargo reported a revenue of Dh12.3 billion ($ 3.4 billion), a 9 per cent increase over the previous year. Contributing 15 per cent of the airline’s total transport revenue, Emirates SkyCargo plays an integral role in the company’s expanding operations. 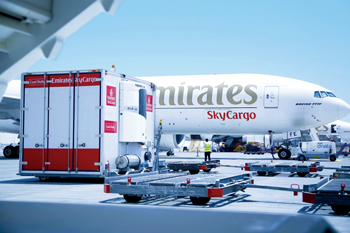 Emirates SkyCargo currently uses cargo hold capacity in Emirates’ fleet of 244 aircraft, including 15 freighters – 13 Boeing 777-Fs and two B747-400ERFs – and provides air cargo services to almost 150 destinations across six continents.